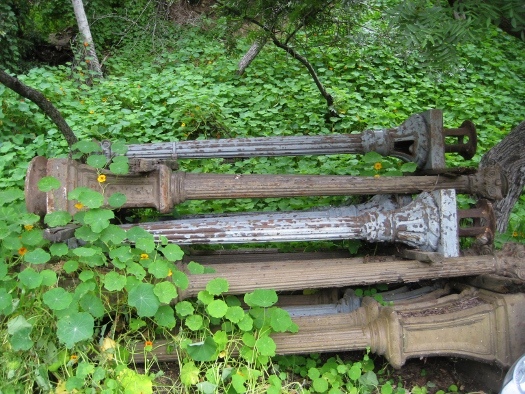 Old lamposts being devoured by nasturtium near Heritage Square, Lincoln Heights. Lately I’ve been thinking about the relevancy of blogs as they seem to be decreasing in popularity from the blog frenzy of the past few years. The decrease is probably due to the amount of time needed to keep up consistent and quality posts and also due to social networking sites like Facebook. FB has definitely eating up most of my daily internet interactions and I constantly tell myself that my attention should be placed elsewhere but the lure of instant feedback along with the communal aspects of FB is strong. Lately much of my non-computer related interests have been in the garden and as I’ve moved my computer near my garden window the siren song of the garden flora calls to me. Anyways, this is just a long roundabout musing on why my posts have decreased. It’s quite lame and sad when things get to this point but it’s predictable. hello, just wanted to say hey. nice picture of the posts and vines. You know, I’ve had the same thoughts. My wife always says that my blogs, emails, and FB messages are too long. Sadly, I have to admit I write them for ME. I can’t express myself any other way. Looking at your ivy portfolio, and the blog notes on LA Eastside, I think you do too. Write and photograph for yourself first – then move to teach or show something. Don’t worry about the feedback. Worry about the truth. You do a good job at that. I started working on both blogs when I was unemployed, now that I’m working full-time with limited internet access, blogging has become more difficult despite the fact that I have lists and lists of things I want to write about, research and share. I don’t think I could ever run out of ideas but sadly, I seem to run out of time. Such is the problem of modern life. My increased attention to Facebook is due to phone apps which makes it quite easy for me to post an FB update while at work or in the supermarket. If I could find a way to post here more easily through my phone, I’d be happy. Chale, mano! Haci es la vida, no. Nunca hay tiempo para hacer lo que es importante.